For those of us who can’t afford Mary Katrantzou (or get their act together to snap up some of her Topshop capsule collection before it sold out), it’s nice that Zara has provided such a cool floral print to liven up evening (or daytime) wear. I’m kind of picky when it comes to floral fabrics, so I kind of appreciate the graphic-y nature of this one. 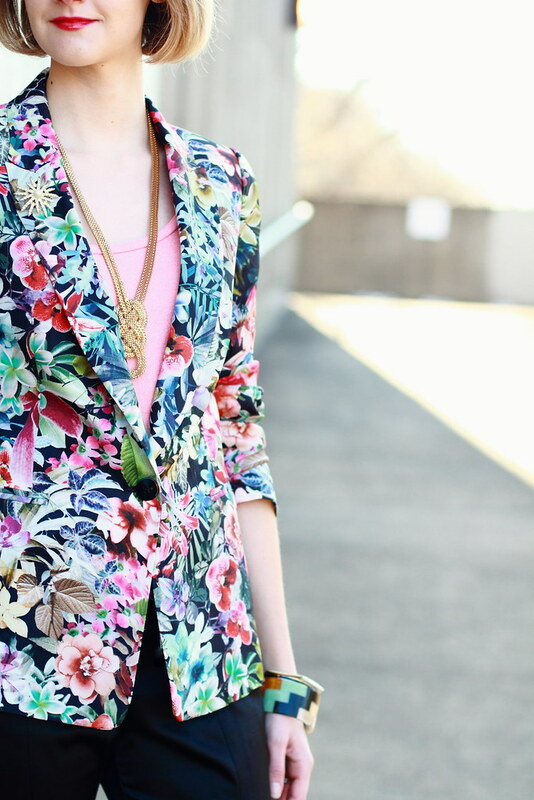 LOVE this blazer! You look amazing! I love to find me a great deal. What an exquisite blazer! I love how the rest of the look is simply chic, so that the blazer takes center stage. Also I usually try not to do these sorts of things, but I am having a seriously amazing contest that is being hosted on my Twitter by Gilt Groupe. You could win a chance to attend La Grande Fête, the launch party for the Jean Paul Gaultier exhibit at the DeYoung Museum in SF. JPG will even be there himself! Check out the details on how to enter here. Good luck! I just bought some floral shorts from Zara…perfection! I'm really picky about florals, too! I need the flowers to look pretty small since I'm so short. These colors are gorgeous on you. I love the shoes! This is awesome! Love that blazer! your heels are a dream! I love the colors of the print! And those shoes are amazing! Adore this. You're right–the floral print is just so crisp and graphic, which is just amazing. With the black pants and your bright lips, it's just a perfect styling. In love with every single piece in this outfit, great look. That blazer is beautiful. Love this look. i want to get this blazer too! you styled it perfectly. Very cute look, E! This blazer and definitely the shoes are just too cute. LOVE the flowery pattern! This and your haircut actually remind me of a French nouvelle vague movie! 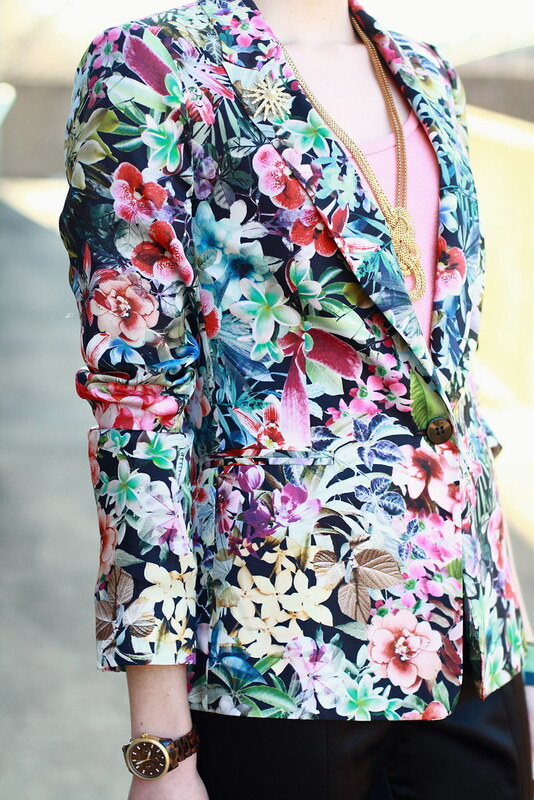 I;ve seen that floral blazer on other places but I wasn;t too sure about it until now, you really know how to style it, love it! this look is so sleek and awesome! You're so beautiful. I am about to pull a Scarlett O'Hara and yank the chintz curtains off the wall to make my very own flower bomb. I think I'll add black leather to toughen it up. I love this on you, E.
The blazer so adorable, and I love your wedge, it amazing. Lovely blog! Very inspirational! Me=following :D! Such a great print. I love how bold it is. I'm also picky about my floral prints, if they're too girly it turns me off. This is one is perfect, and so unexpected on a blazer. I love this outfit from head to toe! This is possibly my favourite look of you so far! So chic and classy! Yeah, I can be pretty picky about florals. There's a fine line between granny and Hawaiian shirts. Though, I always end buying granny prints and then not realizing I hate them until after I wear the item. Ha! I'm still in love with those shoes. thanks for visiting and the sweet comments. LOVE the blazer! Perfect for spring…and the colors in it are great! ah this is great. And I love your Miu Miu shoes so much. Thanks for the heads up on the Zara blazer and I'm crazy about your necklace. I tried this blazer on myself a few weeks ago, and although the fabric makes me deliriously happy, I decided to pass at the time because I couldn't figure out how I would style it. Now I'm looking at your photos and cursing myself. I hope there's still one left in my size at my local store, because I'm totally making a special trip there tonight solely for this blazer.